I try to write a Thank You letter to the Veterans in my life, every year on this day…also on Memorial Day. I also have to admit when I started writing these yearly notes, I did so from a place of “universal guilt”… a cousin to that instant feeling I have when I spot a traffic cop following me, even when I know I didn’t do anything wrong. But I realized a few years back that though many of my generations’ brothers and sisters treated each other poorly…well, horrifically…during the conflict over the Vietnam War and its Veterans, I personally never threw pig’s blood at a returning soldier. Like many of my peers at the time, I didn’t really understand who exactly to be mad at- the military vets, or those who drafted them. So I focused my energy on Peace instead. I was that girl with a wreath of flowers in my hair, who shoved daisy’s into barrels of the guns of local law enforcement, clad in riot gear. Young men about my same age, I have to add, who were just doing their own confusing jobs. In the 1990’s I tried to open my mind to a new generation of returning veterans, so badly wanting them to have a different experience than those brave men and women, drafted or not, returning from Vietnam. And then 9/11 happened and did a permanent number on my heart and soul. It was the birth for me of a new level of awareness. People the world over were responding to “attack” event with such dark black or white hot absolutism. That all coincided with my father’s death so his lessons to me as a kid naturally came rushing back with a warm, loving vengeance. I considered, for the first time really, what he had been trying to say. So now, if I say thank you to a stranger in a military uniform, or when I send out my gratitude, in a note or blog post, I feel no guilt. I still don’t like or understand war, but I have room in my head and heart now for many, many more ways to fight for peace. And I am grateful, and deeply respectful for those who choose the military (and law enforcement) as their vehicle to accomplish that. This year, my sweet James wrote the letter below to his family. He and his siblings have had a wonderful, daily tradition, thanks to their 96 year old mother’s deathbed request. She insisted that they all stay in touch, even though they have lived across the country from each other. The emails to each other, all these years later, is one of my favorite all- time uses of the internet. Today, we remember those of us who have served and died in service to freedom of expression, religion and political choice. I must admit that I am distressed by the present political situation in this country and the direction we are taking. Having said that, I honor all men and women who have participated in protecting us and giving us the right to chose our lives in a turbulent world where such freedom is becoming less and less available. I have heard from the men I served with in Nam and am reminded of the quality of men I was lucky enough to have shared that experience with. on the courthouse lawn to remind citizens that violence against domestic partners is not acceptable as a solution to personal problems. These men have been doing this every Friday for the past four years. They organized after a couple of domestic violence deaths on the island reminded them how prevalent this problem is in our society. Two deaths were recorded there in the past twelve months so it continues to be an important issue for those who suffer at the hands of their partners. These guys are truly Veterans of their own local “war” against domestic violence. And they deserve to be honored, celebrated!! Afterward, we went home where we a nice lunch and we relaxed the rest of the afternoon. About five pm, started a fire in the fire pit and we sat around with an adult beverage until men began to show up for the poker game. By seven, there were eighteen men there. We adjourned to the poker tables and played poker ’til around ten thirty, then back to the fire pit for another round of chat before everyone trickled away for home. We cleaned up the poker mess before retiring sometime between twelve thirty and one am. (I included the description of their gathering after because it demonstrates for me that there are many really wonderful men in the world, a message not so clear in the media these days. Their “Poker Game” has been a monthly tradition in this smaller community for around 20 years. They rotate the home where it takes place. They have what they call a “Party Bag” (different from a Gift Bag) where each person throws in some of the money they win (they play with quarters) and the money is used for things like replacing the worn out felt on their vintage poker table, or, get this, a nice night on the town with the wives! These guys also golf together, and once a year, they take the Poker Game to a beautiful mountain town many miles away, for a retreat weekend of golf and poker. I love the men in this small town. I have witnessed several times over the years, how one guy can put out a call for help (or not put it out) and the rest just show up, barn-raising style. It’s just the way they live. We plan on accepting Applebee’s free dinner for Veteran’s this afternoon. My worker, John is a Navy vet so he’ll get a free meal too. Again, thank you to all who served, men and women, who made the choice, regardless of their reason. It was a precious, brave and probably unbeknownst to you at the time, a healing decision to make for all of us. Worth the watch for the drum and guitar solos…but don’t expect to hold still. Definitely a “pump up the volume” song!! There is a whole HUGE category of people for whom MUSIC speaks way louder and more clearly than any amount of political discussion or rhetoric! Just ask any true Hippie or Flower Child! Here is a second attempt at re-blogging my friend Karuna’s post today. I”m going to put the main song I want to pass on directly in here, in case the re-blog doesn’t work again, but do visit her sight also. She always has great, beautiful, inspiring stuff there. Oh, I so love the opportunity to post one of my favorite songs from one of my top 10 favorite performers. The theme Dream is perfect, although these lyrics are not my favorite part of the song, Sylvan song/Dream of the Archer, by Heart. My favorite part is that it’s an amazing and complex showcase of this group’s talent. Just listen to these voices and the slow build up and total variety of the instrumental parts (I don’t know the correct musical terminology). I chose this version because I liked the comments by the person who put together the pictures for it. A wonderful creative and interesting interpretation of the song. Just found a damn good live version here…. OK, see if you can follow my logic this week. Unity makes me think of the only church I have ever attended with any regularity in my adult life. I picked it in the beginning as a reaction to the oppressive and emotionally blackmailing religious upbringing I had survived. When I first found it, Unity of Bellevue seemed like the place where all the peacenik, flower children had landed. So I stayed…well, off and on, for more than 40 years now. Just about anything they sang (and they had a spectacular variety) was fun or beautiful or inspirational. 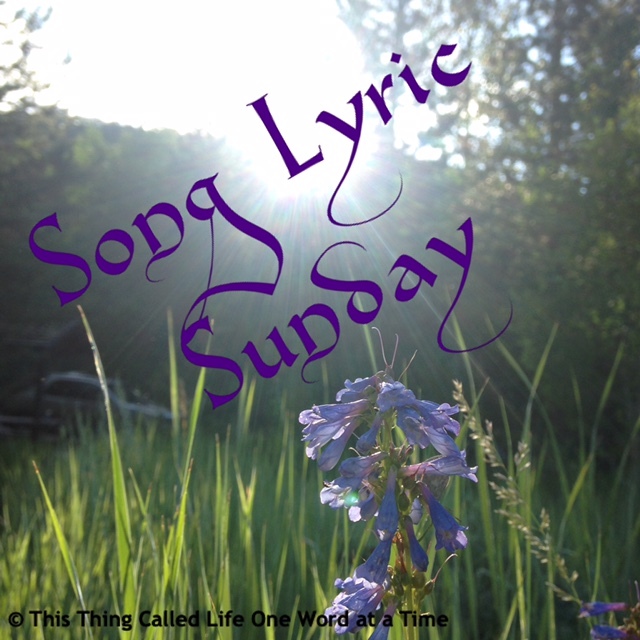 This is a long way to get to my song for this week, but the following is one of my favorites songs by those two women I would hear at the Unity church. Maybe not their most beautiful or modern piece, but the message for me is the thing!! Wish I’d heard this as a squashed kid!!! Thought I’d include info about this weekly challenge.